Did you know that goats enjoy climbing things? According to Amusing Planet some people have built brick towers for goats to climb on. At first I thought it was just a specific type of goat that enjoyed climbing. When I first met Deborah’s goats I noticed that they were very friendly and liked to jump on people. I didn’t think much of it because dogs and cats also like to climb. However, as I did more research I found out that pretty much all goats like to climb. As I watched this YouTube video of goats climbing a tree, I wondered where their ability came from. Goats apparently have great balance, which is one of the key elements in their ability to climb. 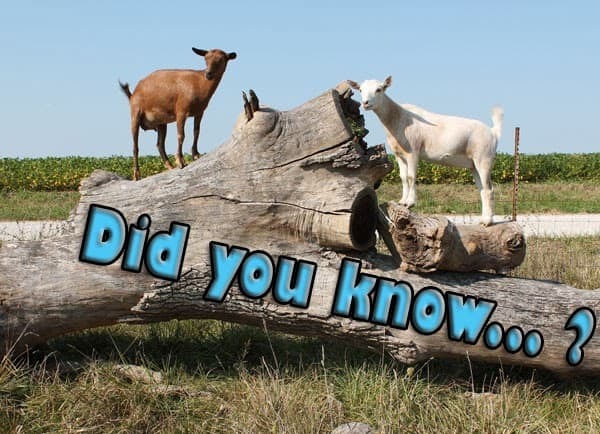 Goats also climb trees because they are prey animals. In the wild, goats have to defend themselves and one way to avoid being dinner is to climb a tree. They also climb trees to eat because as browsers (rather than grazers) they love leaves and bark. In Morocco, goats climb the argan tree to eat the fruit, which is similar to an olive. According to Science Buzz the center of the fruit is a nut that the goats can’t digest, so they spit it out, and the farmers collect the nuts to extract the oil. As seen in this picture, the goats sometimes eat too much from the tree, which can be a problem.